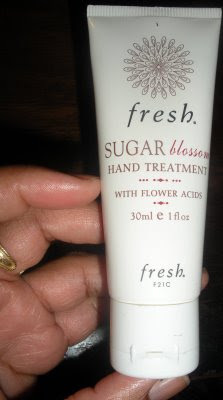 Let me keep this short and sweet - I am reviewing a hand treatment by Fresh and yes it feels fine. It feels as good as any quality hand lotion should feel. It softens my hands and leaves behind a soft scent of sugar and lemons. It contains rose flower water as the base ingredients along with various oils like jojoba, apricot seed and wheat germ just to name a few. But I feel totally ripped off because of the small amount placed in the tube. What you see pictured above is a 1 oz tube which sells for $15.oo. Now I know 1oz isn't a lot but why provide such a large tube. Where my index finger is on the bottle, that's where the lotions reaches. The tube happened to catch some the light and I was able to see through the tube which revealed the small amount provided. For $15.00 I would not but this size product again. I know some days I'm spending big bucks on products and other days I'm getting upset over $15.00 lol but it's just the principal of it all. Message to fresh either provide a smaller tube so that your customers know how little they are getting or lower the price for that amount. After all this product does have parabens at the end of the ingredients list. ( I noticed that after my purchase- sometimes when I am in PJD mode I don't have the most discerning eye..lol). I will end on a happy note, it's a good LITTLE product so if you buy it you probably won't be disappointed. They also sell it in a larger size which I will not purchase because who knows how little my tube would contain. For those of you who use gel eyeliners please answer this- how soft/hard is the gel eyeliner. I made my purchase and I just need to know if I got a bad batch before I post my review or if this stuff is supposed to be this hard. Have you seen different consistencies between different companies that produce gel eyeliners? I want to be fair before I post my review. Also I will probably buy a gel eyeliner to do a comparative review. Have you ever watched even an episode of Tough Love? Who is this man who tries to find dates for these ladies? No, really who is he? I think he is some guy who hooked up a few of his friends and now he is trying to make this a career. He hasn't said anything profound, I seriously could have given the advice he has already given. If you ever watched BET J Short Film show, then you may remember Abiola last season as the host. I can't believe she's on that Tough Love show. I don't know what it will be like where you live but NYC this Friday- Tuesday will be warm and BEAUTIFUL. And where will I be on Friday? In the movie theater to catch The Soloist. I know many people are going to see Obsessed (which I will probably see too) but the Soloist is first on my list. Check the trailer here. Girl I feel your pain buying something for little in return!! It reminds me of how many chips they put in bags these days! They are cheap on the chips! Anywho, I will be seeing obessesed and I'm gonna pass on the soloist....Tell me what's up when you see. i need the info on the gel liners. need to know how to use them too. i wont be in the theaters this weekend. and i cant watch tough love because that man's speech impediment annoys me. plus, like you, i dont know his credentials. That is not enough stuff in that tube! I would have been madddddd but I guess you were, lol. I saw the commercials for tough love and was like umm who are you dude? There are so many movies that I want to see right now, but I am not trying to pay for all these movies! I bought Bobbi Brown's gel liner and absolutely love it! After years of not getting the 'old fashioned' pencil liners to look right, this was my last attempt. I bought the black liner and brush. It's really soft and a little goes a long way. Oh hell nah, Fresh. They have to do better than that. As far as gel liners it depends on the brand. L'Oreal HIP's gel liners are a lot harder than MAC's and Clinique's. I personally like textures....they work for different loos. my gel eyeliner is usually soft, really soft. i have ordered cream liners before and those are usually harder.